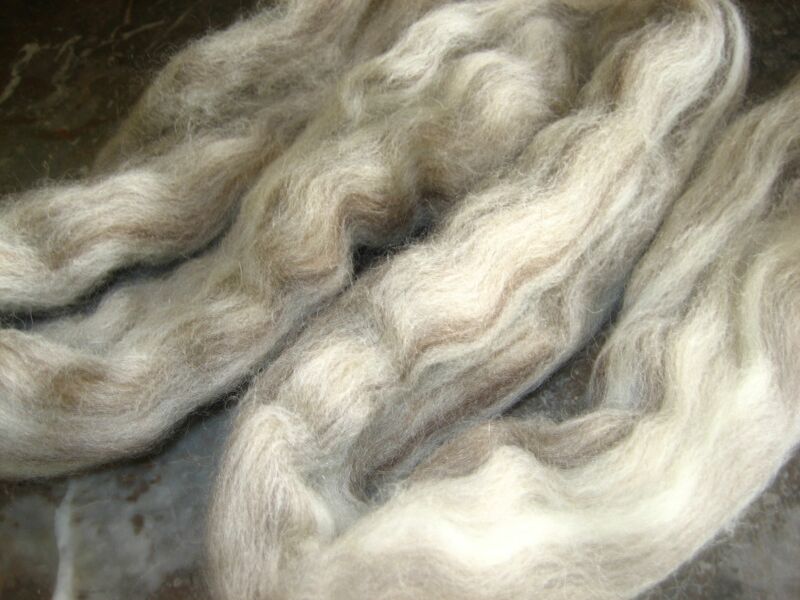 Batt — A thin sheet of wool with the fibers more or less aligned in the same general direction. (see Card, below). Bump — A small ball formed from winding up roving, usually weighing 1-3 pounds. 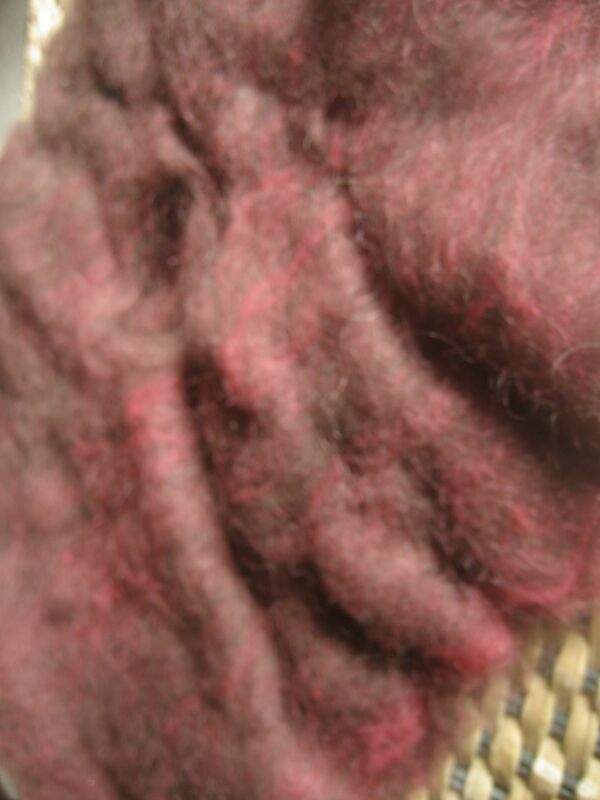 Card — The process by which washed fleece is processed into batts and roving suitable for spinning. 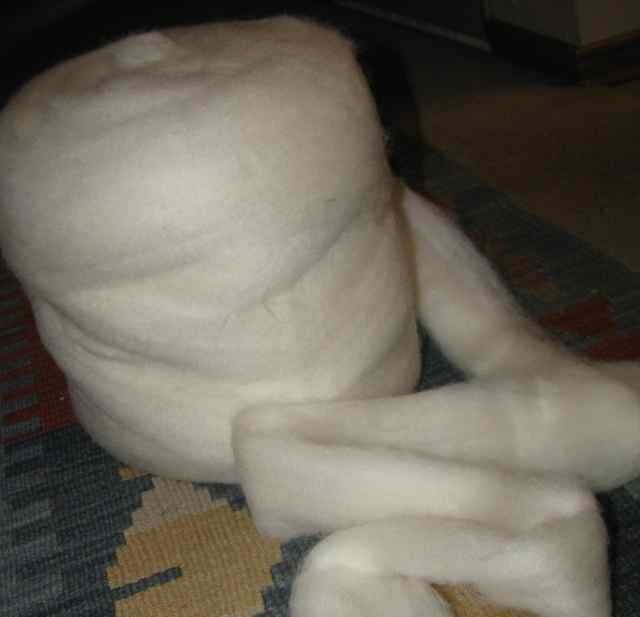 Basically, the word means “to clean, comb or rake the wool.” The matted and dense fibers in the fleece are pulled apart, smoothed out, and further cleaned by removing any debris or knots. The carding process is also where blends can be created by combining different types of wool, or wool and other fibers, such as silk. 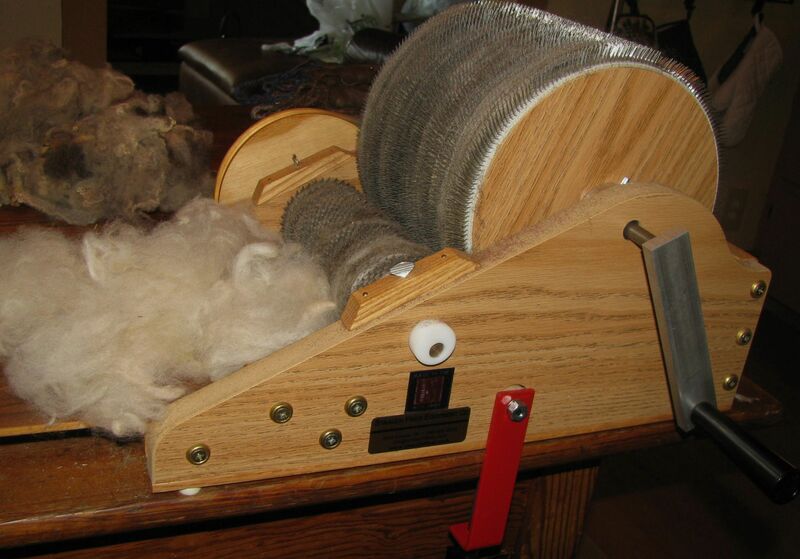 About 300 years ago, a system was developed that is still in use today–the drum carder. These can be purchased as small, table top carders for the home-spinner, or as large machinery for a mill. Before the drum system was developed, fiber was “carded” using hand carders–two paddles with metal teeth on which the fibers are passed back and forth. Before that any sort of plant with prickly ends, or the teeth of small animals was used to brush the fibers into alignment. 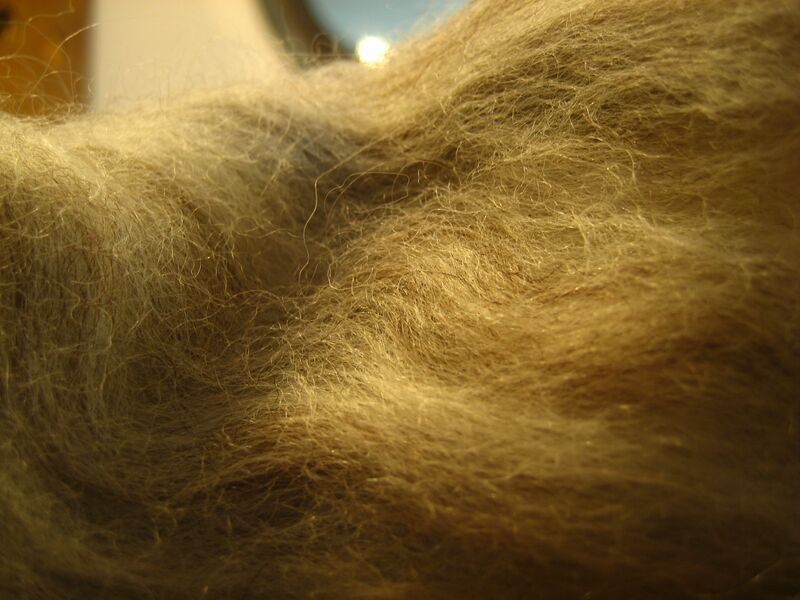 Crimp — The adorable curls in the fleece before the fibers are straightened through carding are called the “crimp.” Some animals have crimp, others do not. 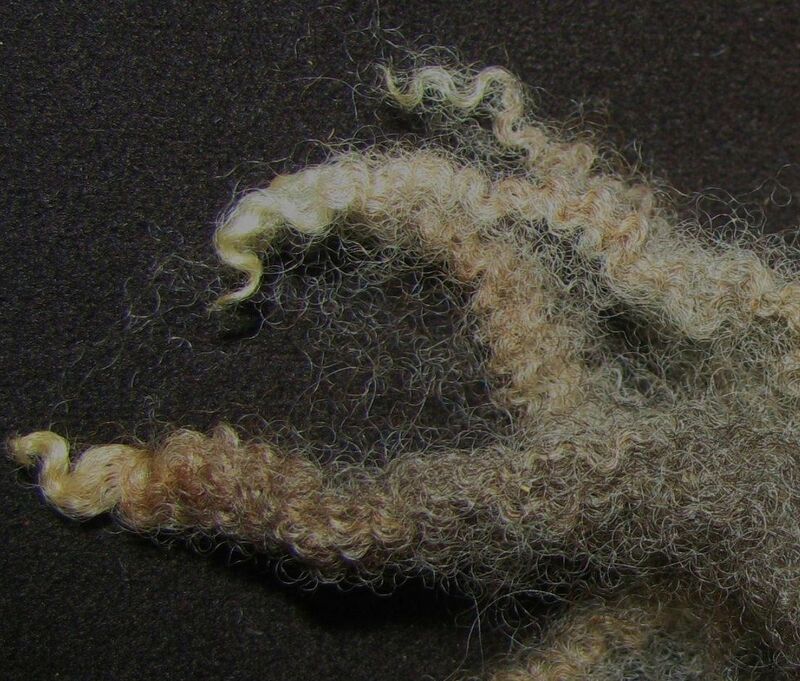 There is a huge debate among wool people about what crimp actually means to the fleece. Historically, it has meant “better.” With sophisticated measuring devices to measure “softness” and “fineness” in garments, the debate is heating up. Whatever. Crimp is darn cute! Roving — Though some spinners like to spin straight from the batt, most of us (especially newbies~) need a little more help prior to spinning. Turning a batt into roving helps us do a better job at the wheel. This is because all fiber preparation prior to spinning is meant to separate and align the fibers. 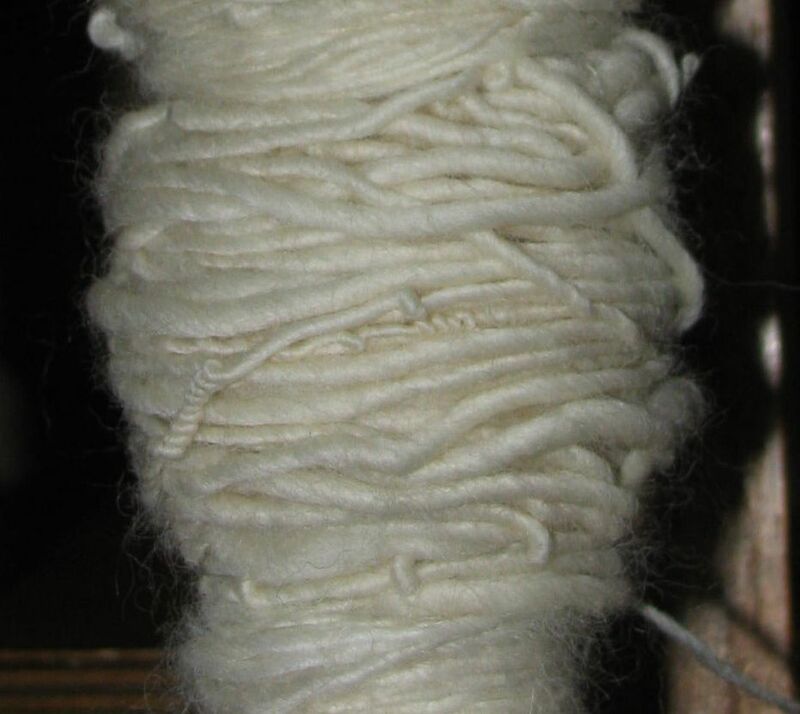 Making roving from a batt is simply further separating and aligning the fibers. The batt is divided into strips, which are smoothed into one long strand. Strip of roving--how smooth and aligned! Nowadays, of course, this is all mechanized and digitized and computerized so that there isn’t really anything interesting left anymore. But that is not the beginning of the story. Thread and yarn both have amazing histories that are mostly overlooked because there is nothing spectacular about going into a store and purchasing a spool of grey thread. But what if you had to produce your own thread when you needed to replace a shirt or a blanket or a pair of pants? Yeah, now that’s interesting. 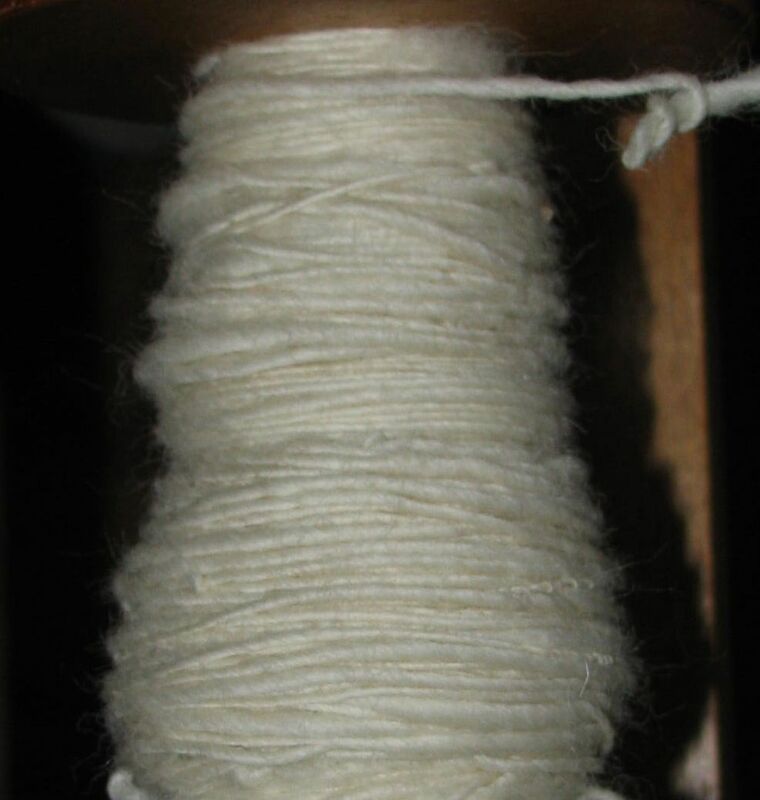 Twist — The energy added to the yarn during the act of spinning. Controlling the twist is the very thing a beginning spinner must learn in order to spin well. The first picture shows work by a new spinner. Notice the extremes between the tiny springs (overtwisted) and the fat cords (underspinning). Note: Advanced spinners produce “textured” yarn with inconsistent twist that might look a lot like this. The difference is that they do it on purpose! In the second picture the spinner has learned to control the twist, and can control it consistently. 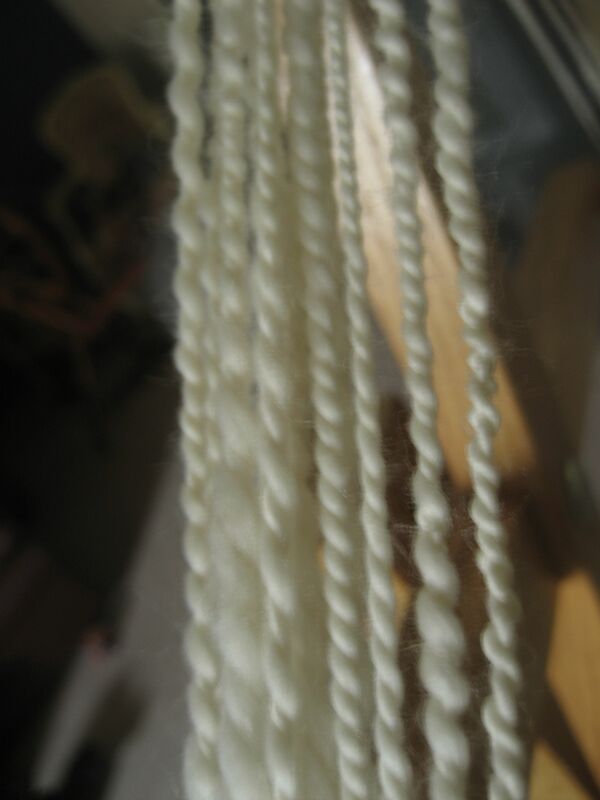 Allowing a lot of twist into the yarn, and doing it consistently, spins a thin, fine yarn.